Source: Desktop Reference for Crash Reduction Factors, FHWA-SA-08-011, Table 11. 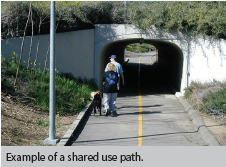 Well-designed pedestrian walkways, shared use paths, and sidewalks improve the safety and mobility of pedestrians. In some rural or suburban areas, where these types of walkways are not feasible, roadway shoulders provide an area for pedestrians to walk next to the roadway. Transportation agencies should work towards incorporating pedestrian facilities into all roadway projects unless exceptional circumstances exist. 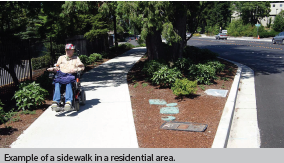 It is important to provide and maintain accessible walkways along both sides of the road in urban areas, particularly near school zones and transit locations, and where there is pedestrian activity. 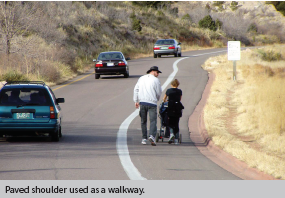 Walkable shoulders should also be considered along both sides of rural highways routinely used by pedestrians. 1 FHWA defines a pedestrian walkway as a continuous way designated for pedestrians and separated from motor vehicle traffic by a space or barrier. By contrast, sidewalks are walkways that are paved and separated from the street, generally by a curb and gutter. 2 National Highway Traffic Safety Administration, Traffic Safety Facts 2015 Data – Pedestrians. Report DOT HS 812 375, (Washington, DC: 2017).